We've been playing around with some variations on our Bead Stew bracelets -- each one is such a great palette for creativity! It is tremendous fun --- the colors are wonderful to work with and the results supremely satisfying. In this one, the emphasis is on beads which "pop" -- in other words, the ones which have off-center holes and thus stand out well on the piece. It reminds me of Lawrence Welk's song "Bubbles." We've got lots and lots of bubbles! We put together some beauties here. There are some tear drops in frosted crystal, both 6x9mm size and 4x6mm size, some megatamas (mostly the 4mm) and drop beads (the 3.4mm ones). Then in between are colors and sizes and shapes to complement, including some fire polish crystals. There are no daggers or leaves or anything that pushes beyond the surface of the bracelet so the overall look is truly one of bubbles. 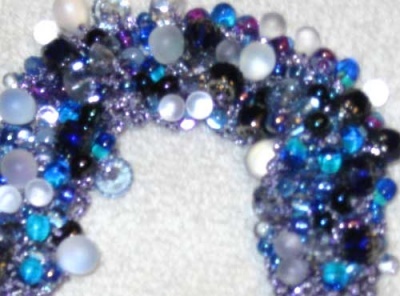 The basic colors are purples and blues and sometimes teals and their family (each mix is somewhat different but all stay with the cool colors) with frosty whites, the thread as shown is a lavender, though it could look marvelous as a pale blue, and the clasp is one of our silver ones. We will be enclosing a different silver toggle clasp than you see here in your kit -- we have a number of great ones but not a huge number of any one type and so far any one that I've tried with this looks good. Each mix is freshly made and somewhat different from the one that went before -- the joy of hand-made items as opposed to machine. 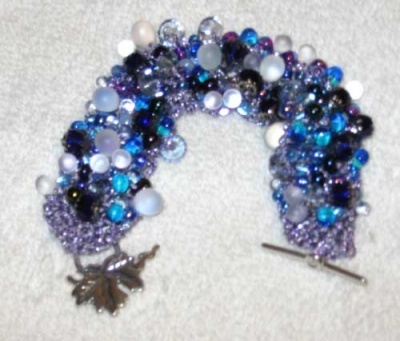 Know that your bracelet will be absolutely unique both from how you choose to put your beads together as well as the beads themselves. And we might very well choose a different color thread to go with your individual kit -- the mix might call out for it. Sometimes it looks better with a blue or a silver or another thread -- unless you have a color you want to emphasize, let us choose for you. 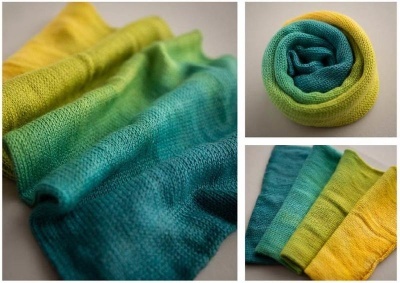 These are great fun to knit! All you need to supply is the knitting needles -- we use size 0s but I tend to knit loosely. Gauge is not a huge factor here -- you just want a look and a hand that is pleasing to you. A wonderful song to wear in cool colors for your wrist!